Pompeo Declares Midterms Safe From Interference - Joe.My.God. “I have no doubt that the Russians have every intention of making life difficult for every American. This has been going on for decades. So please know, the American people should know, that the U.S. government is actively engaged in efforts to ensure the Russians, Chinese, Iranians, North Koreans – all of those – with malintent for America, will not have the capacity to have substantial interference in the American elections. 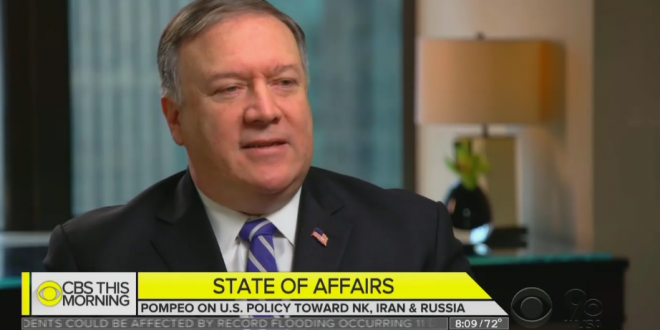 We’re diligently working on this and I’m confident we can achieve it.” – Secretary of State Mike Pompeo, speaking today on CBS This Morning.
.@SecPompeo says he is confident November’s midterm elections will be safe.